Let's go to 1943 Phoenix, Arizona. 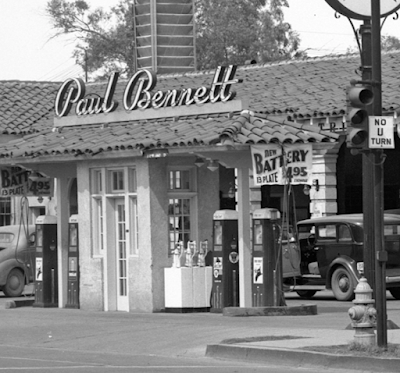 Luckily, we have a nice new car, and luckily, we're right near Paul Bennett's Super Station, which was on the northwest corner of Van Buren and 2nd Avenue. You may be saying, "Now waitaminute, we've got a brand new car, shouldn't we be able to just get in it and go?" 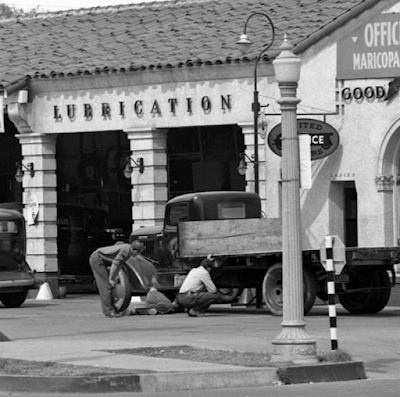 But it's 1943 and even brand new cars need a LOT of maintenance. Maybe not as much as in the old "Model T days", but a lot more than they would need in the 21st Century. The most important thing is regular lubrication. The guys who work there are often called "grease monkeys" because they're always covered in a lot of grease. I have no idea how many lubrication points my car has, but it's a lot. And they need to be attended to on a regular basis. Yeah, I could get a grease gun and do it myself, but luckily I'm wealthy enough to have Bennett's do it, and do it right. Of course I'm going to have Goodyear tires on my car. I know how important the Goodyear company has been to the economy of Phoenix, starting way back during World War I. It's that long-staple cotton, usually called Pima cotton, that reinforces Goodyear tires, although I've heard people talking about maybe replacing the cotton with something plastic, one of those crazy chemicals they're working on nowadays, like Nylon. 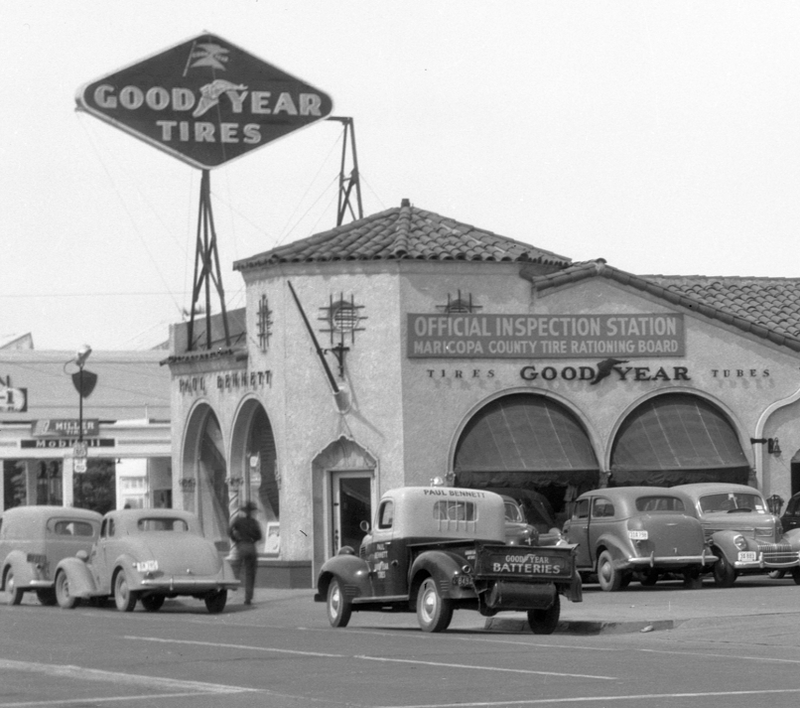 You know, I haven't driven out to Goodyear for a long time, now that I think of it. Maybe I'll go play some golf over at the Wigwam. But first I'm going to get a tune-up - hopefully all they'll need to do is to gap the plugs, set the timing, and replace the points. I'll fill up the tank with gasoline from the Texas Company. I hear it's good gas, although it's all the same to me. I wonder if Paul is around today? He sure has a great place! Hmmmm.... I wonder if I need a new battery?